The 1990 television movie, Spymaker: The Secret Life of Ian Fleming, is now available on DVD from the Warner Archives Collection. This was the American answer to the British television biopic, Goldeneye, which starred Charles Dance as Fleming and came out the year before. 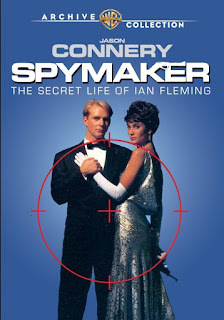 From what I recall, Spymaker was the inferior movie, but it had a nice hook in that Sean Connery's son Jason Connery played Fleming. It also stars Kristin Scott Thomas and David Warner. You can purchase Spymaker: The Secret Life of Ian Fleming on Amazon.com.